[GK Games] Balancing Act is now available! Now available at Drive-thru RPG! Home of the Clement Sector setting. Re: [GK Games] Balancing Act is now available! 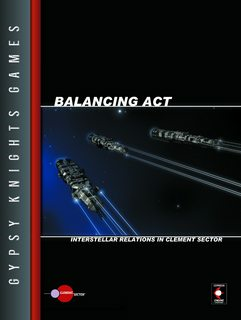 Balancing Act: Interstellar Relations in Clement Sector is now available in print! Can you look at changing the publishers preview on DTRPG? I was dithering between getting printed or pdf version and the 3 pages provided is, in my opinion, woefully inadequate to make a purchase decision on. The three pages provided don't really give a feel for the book, and not seeing the index means a prospective buyer doesn't have a clue about the book coverage. Indexes are great! ENTIRE indexes are even MOAR great! !